M2 is a widely used measure of the money supply but since inflationary and deflationary periods can warp it, we look at inflation adjusted M2 (using CPI numbers). This gives us ‘real’ M2 which is more useful to compare across time. But we also have to account for the number of people in the economy because everything else being equal, on average, the more people we have the more money is used by them. So we divide the real M2 by the estimated monthly US population to get per capita, ‘real’ M2. 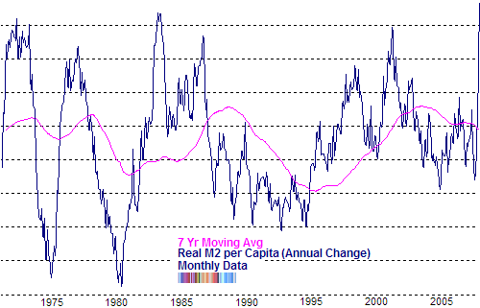 Then finally, we are interested in the annual rate of change that occurs in the real per capita M2 money supply, which gives us the chart you see. The middle line represents zero, so anything above that means that the rate of change in money supply is positive and the Fed is pumping money into the economy (and vice versa). Obviously, the more extreme the move and the more the line stays above the 7 year moving average, the more significant it is. From the latest data available (January 2009), the annual rate of change is higher than it has ever been - even higher than the early 1980’s. This means that eventually, as it works its way through the economy, there will be more and more money chasing fewer shares, driving up the level of the stock market. the wild gyrations of the per-capita money supply 1970-1995 stand out. Also of note is that recent QE actions have raised the per capita supply to only just over where it was in 1983. All very interesting but as yet I have no idea how to interpret this data. also worthy of note is how little the striking downward trend in rates since 1983 has actually affected the amount of M2 money held by each american. They wouldn't know M2 if it bit them on the face with tiny incisors. Everything possible is being done to keep them in the dark. 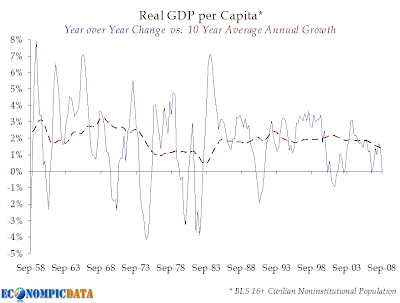 what is interesting here is how the per capita growth rate is so stable throughout all the ups and downs of the last 50 years, hovering around 2%. historically growth rates have been bandied as 4,5,6,7% per year, but those are aggregate rates. Per capita is much lower. If only we could import 10million+ immigrants every year to spread that burdensome money supply around onto, instead of this paltry 500k or so, then our problems would all be solved.